Okay I pulled this account from Blonde Housewife, who pulled it from BlackFive(dot)net I’d been looking for something to post about today and this seems the most appropiate. On a day when so many gave the last full measure for the United States of America. It actually started on June 5th. And it almost didn’t start then. The weather had turned bad. A great storm had blown in from the Atlantic. High wind and high seas had forced ships of all kinds back into bays and inlets. Low clouds made it impossible for aircraft to find landmarks. If the weather didn’t break, nothing would happen until at least July. But the weather did break, and so, it began only a day later than planned. 150,000 soldiers—American, British, Canadian, French, and many others—embarked on 5,000 ships, began moving towards places known today as St. Lô, Vierville-sur-Mer, Pouppeville, Arromanches, La Rivière-Saint-Sauveur, Pointe-du-hoc, Ouistreham. The men on those ships, for the most part, didn’t know those names. They had simpler terms for the beaches where they would be spending the day—and for many, the rest of their lives. They called them Juno, Sword, Gold, Omaha, and Utah. There were soldiers from many nations involved that day, all of whom deserve to be recognized and remembered. But as an American, it is the men from my country that I will write about. Only about 15% of them had ever seen combat. But by this time, cold, wet, seasick, crammed into airless holds, or huddled on unprotected decks, many of them preferred combat to what they were going through on board ship. Get us off these ships. I don’t care what’s waiting for us. As it happened, though, it didn’t begin on the beaches, but in the air. On the night of June 5th, an armada of over 800 C-47 transport planes ferried the US 82nd and 101st Airborne Divisions over the invasion fleet towards France. For them, the weather was still pretty bad. And it was dark. It was going to be difficult. Everything depended on landing the pathfinders in the right place. Then the pathfinders had to light the dim beacons for the landing zones. The pilots carrying the airborne forces had to see the beacons, then they had to fly precisely, right over the landing zones. And the Germans. Always the Germans, with searchlights and flares and the 88mm anti-aircraft cannon—the “flak” guns. Getting everyone down alive, together, and ready to fight was going to be a chancy business. And the airborne troops knew it. And still they fought. Gen. Taylor soon had gathered a force of 90 officers, clerks, MPs, and a smattering of infantrymen. With them, he liberated the town of Pouppeville. Elsewhere, American soldiers gathered into groups, and struck out for an objective. Even if it wasn’t their objective, it was someone’s, and they were going to take and hold it. And when they took it from the Germans, the Germans tried to take it back. But the paratroopers held. It was a terrible day for paratroopers, but they did terrible fighting in there and they really made their presence known. By this time, the Germans knew something was going on, if not precisely what. Their responses were confused. Their commander, Field Marshal Erwin Rommel had returned to Germany for a brief leave. He wasn’t the only one absent that night. The 21st Panzer Division’s commander, Lt. Gen. Edgar Feuchtinger, was spending the night in Paris with his mistress. Col. Gen. Freiderich Dollman, commander of the 7th Army, and many of his staff officers and commanders, were 90 miles away in Rennes, on a map exercise. Ironically, the scenario for that exercise was countering an airborne landing. The Germans were surprised, yet subordinate commanders began to take the initiative, seeking out the paratroops and engaging them, trying to determine what was happening. Was it the invasion? A diversion from the expected landings in Calais? What was happening? Then, as the black night gave way to the cold, gray dawn of June 6th, they began to find out. Looming out of the fog, a vast armada of haze gray ships and landing craft began to move ashore. At 5:50am, the warships began shelling Utah and Omaha Beaches. In the exchange of fire with German artillery on Utah Beach, one of the landing control ships was sunk. As a result, when the first wave came ashore on Utah beach at 6:30am, they were 2,000 yards south of their designated landing point. It was a blessing in disguise. There was almost no enemy opposition. Brig. Gen. Theodore Roosevelt Jr. made a personal reconnaissance past Utah beach, and found the beach exits almost undefended. He returned to the beach to coordinate the push inland. 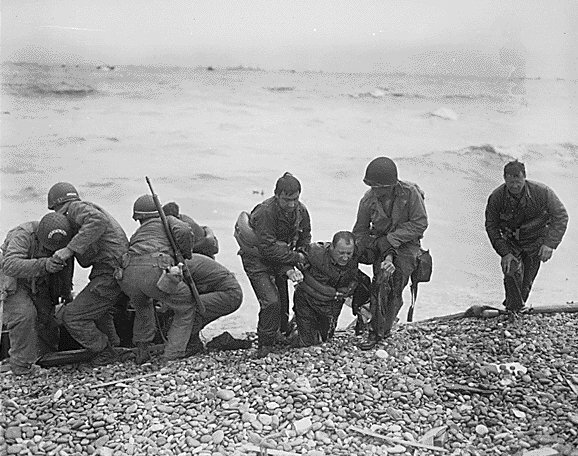 By the end of the day, 197 Americans were dead around Utah Beach, but the landing force had pushed inland. At Omaha Beach, the story was much bleaker. At around 6:30am, 96 tanks, an Army-Navy special Engineer Task Force, and eight companies of assault infantry went ashore, right into the teeth of withering machine-gun fire. Despite heavy bombardment, the German defenses were intact. Because the landing was at low tide, the men had to cross 185 yards of flat, open beach, as the well-protected German gunners cut them down. Tanks were sunk in their landing ships, or blown up at the edge of the water. Them poor guys, they died like sardines in a can, they did. They never had a chance. The men from the 29th Division’s 116 Regimental Combat Team (RCT) and the 1st Division’s 16th RCT were pushed off course in their landing craft by strong currents, and landed with machine gun bullets spanging off the gunwhales of their LCT’s. When the bow ramp dropped, men were riddled with bullets before they could even move. Others, jumping off the sides of the ramp, burdened with their equipment, drowned as they landed in water over their heads. Many more died on the beach, at the water’s edge. You couldn’t lay your hand down without you didn’t touch a body. You had to weave your way over top of the corpses. The first instinct for many was to crouch behind the steel anti-tank obstacles, to take cover behind the bodies of fallen comrades, to try and scrape shallow trenches with their hands. And yet, they couldn’t. More assault waves were on the way, and the volume of fire was so great that to stay where they were meant certain death. The beach had to be cleared for the incoming waves of infantry, but to move across that open beach also seemed like a death sentence. And so they did. They crossed that empty expanse of beach to the only cover to be had, a narrow strip of rock shingle at the base of the cliffs, below a short, timber seawall. Those who made it to the shingle in those first hours…just stopped. Behind them was a carpet of bodes, and a tide that ran red with blood, making the spray from the curling waves a sickly pink. Ahead of them were intact and well-armed German defenders. Those men cowering on the shingle behind the low seawall had seen their units decimated, watched successive waves being slaughtered as they hit the beach. Shocked and disorganized, they stayed beneath the seawall, in the only narrow strip of safety they could find. Meanwhile, at Point-du-hoc, at 7:00am, the men of the 2nd Ranger battalion came ashore beneath the cliffs. Their mission was to climb the steep cliffs with grappling hooks and ropes, to capture the German heavy artillery threatening the Omaha and Utah landings. Under heavy fire from the cliffs, they fired back with the small mortars that launched the grappling hooks. With their fellow rangers dying on the beach beside them, they grasped the ropes and climbed. They climbed until German riflemen picked them off. They climbed while they watched their buddies arch in pain, and then fall headlong to the rocky beach below. They climbed as the men above them plummeted into them while falling, threatening to tear their fragile grip from the rope. They climbed and climbed. And when they got to the top, the Germans were ready for them. But the Rangers were ready, too. So they fought their way through the pillboxes and trenches surrounding the gun emplacements. Pushing through the Germans, killing them to capture the guns. And when they did, they discovered that the guns weren’t there. The men of the 2nd Ranger battalion had captured empty concrete emplacements, at the cost of half their number. Back on Omaha Beach, the carnage continued. Confusion, total confusion. We were just being slaughtered. And as for the men (Huh. “Men.” Most of them hadn’t yet seen their twentieth summer.) who had survived the holocaust on the beach, and who now hid behind the tiny cover of the shingle? Well, who could have blamed them if they had just quit? Decided that this one taste of violence and death was enough for a lifetime? Decided that they didn’t want to face what must have seemed like inevitable and horrible, painful death? And yet…they didn’t. Somehow, they gathered whatever courage was left to them, and began to try and figure out how to get off that beach, and move inland. We were recreating from this mass of twisted bodies a fighting unit again, and it was done by soldiers, not by the officers. It was C Company of the 116th RCT, accompanied by men from the 5th Ranger Battalion, that began the push. At the top of the seawall was a narrow road, and on the other side of it, protecting a draw, was a mesh of barbed wire. Pvt. Ingram E. Lambert jumped over the wall, crossed the road, and set a Bangalore torpedo in the barbed wire obstacle. He pulled the igniter, but nothing happened. Caught in the open, Pvt. Lambert was cut down by machine gun fire. His platoon leader, 2d Lt. Stanley M. Schwartz, crossed the road, fixed the igniter, and blew the torpedo. The men of C Company and 5th Rangers began crossing through the gap, some falling to enemy fire. As they left the beach, and assaulted through the draw, others followed. Those men shivering behind the seawall grabbed their rifles, stood up, and began leaving the beach, moving toward the Germans. Other breaches in the German defenses followed. Company I of the 116th RCT breached the strongpoints defending les Moulins draw. The 1st Section of Company E, 16th RCT, who had come ashore in the first wave, along with elements of two other companies, blew their own gap in the wire, and moved inland. Company G, 16th RCT, needed four Bangalore torpedoes to cut a single lane in the wire and anti-personnel mines that were set up with trip wires. The breaches were narrow, and tenuous. Follow-on waves still faced murderous fire from the bluffs overlooking the beaches, and there was still confusion as the timetable was set back by the initial fury of German defenses. The 18th RCT was originally scheduled to land at 10:30am, but didn’t get on the beach until 1:00pm. The 118th RCT was delayed even more. By the end of the day 3393 Americans were dead or missing, 3184 wounded, and 26 captured. But the breaches in the German defenses had been made. The Americans were ashore, and they were moving inland. The “Atlantic Wall” had been broken, but at a heavy cost. When I was relieved and I walked by, oh God, the guys that died that day — all those beautiful, wonderful friends of mine, the day before, the night before, kidding and joking. Field Marshal Gerd von Rundstedt was the German Army’s Commander in Chief, West. He was a crusty old soldier who disdained the flashy accouterments of rank that a German field marshal usually wore. He was content to attach his batons to the shoulders of his old regimental colonel’s uniform. He was also a realist. Knowing what D-Day meant, he called the Chief of Operations for the German Armed forces, Col. Gen. Alfred Jodl. “What do you suggest we do now, Herr Feldmarschall?” Jodl asked. “End the war, you fools! What else can you do?” replied the old warrior. Truely an amazing element of the worlds history. I know some of these men who survived. I wonder, with our current cultural values and traditions, if the same could happen again. Of course the technnology is different today. Would/Could the circumstances line up for the same expression of values as were exercised on that day? Thank You:) Where have you been? Just came across your blog…Busy season for you I am sure.